How to Measure My Hat Size? How to Measure My Boa Size? Can you share any care tips? What is the first steps after receiving my furs? - How to Measure My Hat Size? The best way to get a properly fitting snug hat is to measure the circumference of your head (in inches or centimeters). You will need a good tape measure to get an accurate measurement of your head. Ask someone to help you if you are unable to do it yourself. Take your time to ensure an accurate fit. The human head assumes many shapes and sizes. 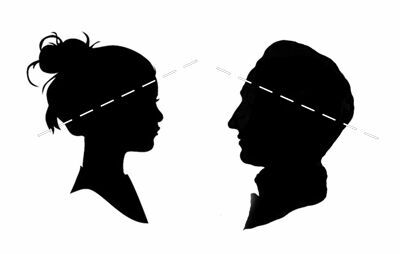 Even on an individual head measurements will vary if taken in different spots. Therefore, it is important to take the measurement at the right spot on your head. It is not sufficient to wind the tape around your forehead and assume that is the correct measurement for your head. You can determine exactly where to set the tape on your head by wearing a hat that you already own to see where it settles. Generally, the ideal spot to measure is just above the center of the forehead, about 1/8 of an inch over both ears, on the top slope of the lump at the back of your skull. The most of our hats are adjustable. If the hat is a little too large you can make it smaller simply by tightening the silk bands on the inside. Good quality natural fur is somewhat elastic and if your hat is a bit too small it will become slightly larger by stretching a bit as you wear it and it conforms to your head. Fur wigs have a knitted base, this means that the hat simply stretches around your head to fit. But when ordering a fur wig the most important requirement is the height measurement. The height of our standard wig is approximately 19-20 cm. This size will fit most heads. If you have voluminous hair, however, or a non-standard big or small size you should measure your head first. Use a measuring tape to measure your head from the front line (just above the eyebrows) across the top of the skull to the back point of the head; one half of this measurement will be your height size. For example, after measuring you determine the number is 38 cm, divide this in half to obtain 19 cm - this is the size that will fit. If your size is between 15-20 cm you can simply place your order. If your height size is more or less than 15-20 cm you should contact us before placing your order so that we can confirm product availability. - How to Measure My Boa Size? We are trying to make our boa models universal to fit different shapes and sizes but before making a purchase we recommend that you visualize how it will look on you. Consider where will the ends of your collar be and how wide will the boa be on your shoulders. Each of our models has several parameters for length and width. Check these parameters for each model on the item description page then using a good tape measure, put it on your shoulders to see the original length. Do the same to see the width. We are the manufacturer and could make any custom changes to our accessories. If you are not sure that our standard model is for you send us an email so we could discuss customizations. Original Russian manufacturer, good quality fur, original design and custom improvements. Are you sure that you could find something less expensive in your area? - Can i pay in my local currency? Yes, we accept USD, CAD, AUD, GBP and EUR. Use selector at the top right corner please. - Will I Receive Confirmation of My Order? We send email confirmations of all orders placed through our online store. If you do not receive an email confirmation from us within a reasonable amount of time after placing your order please check your spam or junk mailbox. You can add our email to your address book to insure our confirmations arrive in your inbox instead of your spam, junk or sales promotion folders of your email account. If you have not received an email confirmation please don’t hesitate to contact us directly via phone, text or messaging through iMessage, WhatsApp, Viber, Facebook or telegram messenger accounts. We guarantee the full refund if you don't like the item that you received (You have 14 days after receiving to declare your unhappyness). In that case you must ship it back and when it will be delivered back the full amount will be credited to your account. We are responsible business and we are ready to resolve any possible problem as good and fast as possible. - Can you share any care tips? Oxidation is the enemy of fur so it is best to store your fur accessories in a cedar lined closet or in an air tight container away from sunlight and extreme heat with some cedar blocks or chips in the box. Do not store furs in plastic bags as this prevents the skin from breathing properly. As an alternative to using chemical moth balls you may put a sachet of herbs containing 2 ounces each of dried mint and rosemary, 1 ounce each of ginger and thyme and 8 ounces whole cloves in with your furs. Other herbs you can use to repel moths include lavender, sweet woodruff, tansy, and lemon rind. You can buy herbs in bulk at most health food stores. Fabric softener sheets that are used in clothes dryers are an excellent moth repellent. Tuck a dryer sheet inside your fur hat or muff. - What is the first steps after receiving my furs? We ship our hats inside out to protect fur along the way. Turn your hat right side out after receiving. Fluff and smooth the fur with your fingers. If necessary you may use a professional quality round hair brush to lightly & gently brush the fur into shape. You may spritz the fur with a tiny bit of cool water, fluff with your fingers, place the hat over a round form and allow to air dry and fluff again. Never use heat drying methods. Can't find answer on your question? Feel free to communicate with us "Contacts".